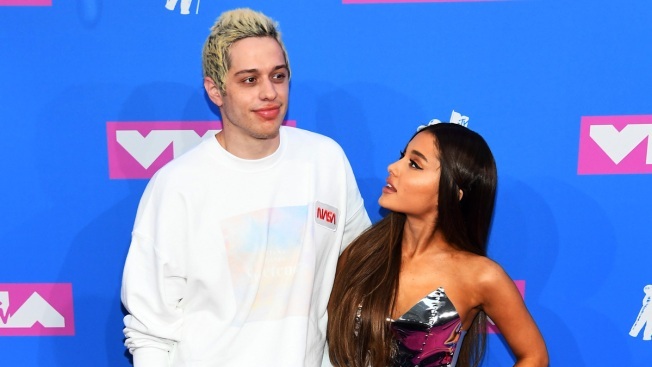 In this Aug. 20, 2018 file photo, Pete Davison and Ariana Grande attend the 2018 MTV Video Music Awards at Radio City Music Hall in New York City. It's over between Ariana Grande and Pete Davidson. The 25-year-old singer and 24-year-old SNL star began a whirlwind romance this summer and quickly became a fan-favorite celebrity couple. In June, it was revealed that Grande and Davidson were engaged and she soon showcased a diamond ring. News of their breakup comes a month after her ex Mac Miller was found dead at age 26. The singer mourned the rapper's death publicly on Twitter and stepped away from the spotlight. "It was way too much too soon," a Grande source told People of the singer and Davidson's split. "It's not shocking to anyone." TMZ, which first reported the news, said the two broke up this weekend and that they acknowledged that it was not the right time for their relationship to take off. Grande and Davidson have not commented on the breakup. Soon after they got engaged, Grande and Davidson moved in together to a $16 million New York City apartment that she bought. They recently adopted a piglet, Piggy Smalls. Grande called the pet an "emotional support pig." Mac's death came more than a year after 22 people were killed in a suicide bombing at the singer's concert in Manchester. Grande was not physically harmed, but she was left with PTSD. "Given the events of the past couple of years, Ariana is going to take some much needed time to heal and mend," her team said in a statement on September 17. "She will be staying close to home and using this period to spend time with her loved ones and work on new music without deadline." Grande soon canceled a scheduled performance on SNL's 44th season premiere, although she did accompany Davidson to the live taping. During the show, their relationship and engagement were often mentioned in sketches. This Saturday, Ariana also canceled another scheduled performance, at F--k Cancer's inaugural Barbara Berlanti Heroes fundraising gala, where her manager Scooter Braun's wife Yael Cohen Braun received an honor for her work as co-founder of the group. "One of the most amazing things about this organization is that they help people when they're having the worst moments in their life, and they give sympathy and a calm nature to people in need in those moments. And you saw your invite, someone I'm very close to was supposed to come sing for you today, and because of things that she's going through, she couldn't be here today," Scooter told the crowd. "And while I was frustrated, being the manager, my wife, being who she always is, just looked at me and she goes, 'She needs this time.'"